Score 65% off with code 75X3F2DD. Price drops to $17.08! Image Sensor & Screen: 12 mega pixels CMOS Sensor and 4 x digital zoom ensures highly clear and awesome photos. 2" HD Screen, allow kids shooting while watching. Underwater Waterproof Design: not only photo shooting, but also video recording, it brings more fun when swimming and diving. The camera can record video and sound. Super Flash Light: Super strong flash light and fast response ensures quality shooting in any conditions. The flash is not only for taking pictures when there is insufficient light, but also for when the subject is in shade or with backlight conditions. HD display screen acts both as a viewfinder and playback monitor. 8G TF Card as Free Gift: Storage Media is Micro SD card, up to 32GB (include SD card), Compatible with Win XP / Vista / Win 7 and Mac OS x 10.5.8 or above. 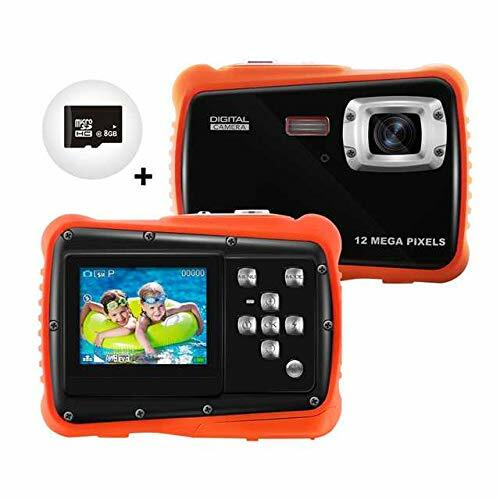 Fantastic Gift for Kids: Lovely cute design and mini size (2.95x2.76x0.98 in, 110g) with Dustproof design and this kids camera is a perfect summer and birthdays gift for boys and girls who love outdoor activities and water sports. Let your kids fully enjoy fun of photo-taking in the summer vacation.